Yesterday we went on a lovely walk around Quarrymill Woodland Park! It’s only a few minutes out of Perth and there is lots to explore with your dogs! There are also benches dotted around if you wanted to take a picnic with you and lots of places for your doggy to have a paddle, if they enjoy the water. After our walk we headed to Macmillan Coffee Shop which is located at the entrance to Quarry Mill. It’s run by a lovely group of volunteers who do fabulous home baking! Dogs are welcome to sit outside at the patio area so Baxter enjoyed sunning himself while me and Laurie enjoyed a cup of tea and a slice of cake! It’s wonderful having fantastic walks like this right on your door stop! Great to hear. We are meeting family in June and were looking for somewhere we could take the dog to as well. 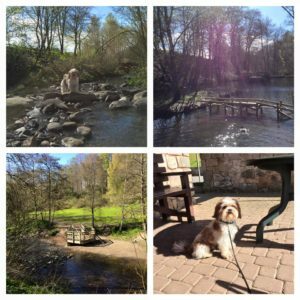 Perth was our destination……and now it looks like Quarrymill with its walks, waters and cakes and coffee will fit the bill. Cheers!